This article was originally posted at my Big Cheese Coaching blog. I had a coaching session with one of my clients this week. We’ll call him “Jamal” for now. He is trying to change career paths and has been doing all the right things. Except for one area. He confessed to having some difficulty in the networking arena. In exploring further, he shared he’s been going to courses to learn new skills; he attended a few related meet-ups. But he goes to these events and doesn’t talk to anyone. He listens to the presentations/course — then leaves. These learning events (courses, meet-ups, etc.) are perfect opportunities to network with like-minded people. But what if you are shy like Jamal is? How do you break the ice and start (and engage) in conversations if this isn’t natural to you? I shared a few steps that he could do to help him break the ice and engage in conversations more naturally. I thought I’d share them here too. Start by wondering about the people in the room. What brought them there? What is their background? Might there be some common ground? What do they think of the course/meeting, etc.? By tapping into your genuine curiosity you open up a door to a potential conversation. Faking small talk really doesn’t work. 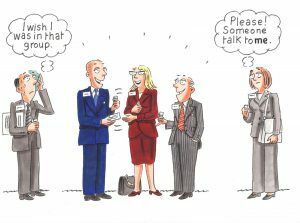 This is what makes people feel ‘icky’ (hence: ‘networking is icky’). Instead get real and truly wake up your curiosity by asking yourself some questions — starting with the phrase: “I wonder…”. “I wonder what brought this person here…..I wonder what he/she thinks of the event/conference….I wonder what kind of experience they have in the area I’m interested in….” — and so on. Everyone has the capacity to be curious. For some it comes more natural. But if you aren’t present to it in the moment, you can wake it up by simply reminding yourself to wonder and be curious. Step #2: Muster up a Few Seconds of Courage and Say Hello. Like Jamal, some people will find the curiosity part easy. The ‘walking over and starting to talk’ part may feel excruciatingly difficult. But here’s the good news: All you need is a few seconds (5 or less)of courage to take those first initial steps. If you are already filled up (and armed) with genuine curiosity, you will know what to say when you approach someone. Ask yourself this question: “Can I generate just a few (3-5) seconds of courage — right now? Because that’s all you need. Most people indeed can do that. When I think of all the courage Jamal needed to move to Canada (from India) on his own; establish a new life; start a new job, and so on….I knew he already had courage in spades. He just needed to access it in the moment. Can I generate a few seconds of courage right now? Step #4: Approach Someone; Introduce Yourself ; Ask a Question. Chances are the person you approach will be grateful, gracious, and will reciprocate. Who knows, they may have been feeling as intimidated as you do! From there the conversation may simply roll. You likely won’t have to carry the weight of the conversation by yourself. But if they are a bit quieter by nature too, you can help a long by asking other questions such as: what brings you here? Do you have experience in this area? And so on. Sometimes people who are shy and on the quieter side have an advantage. They are good listeners. If you’ve started a conversation then make sure you tap into your listening skills and keep that curiosity going. People love to be heard. So asking people about their experiences, perceptions and giving them a chance to talk can be a gift to them. Of course, you can’t just stand there and only listen. You do need to talk too. Know that your curiosity and presence will support you and allow the conversation to unfold authentically. Step #5: Complete the Conversation Well….With a Door Open. At minimum, you want to complete the conversation by acknowledging the person — e.g. perhaps telling them it was nice to connect. You can wish them good luck with their work or something that conveys a wish that they enjoy the course/conference. And reciprocity is always a good ideas! You can invite them to connect further if you can be of any help to them. When I shared these tips with Jamal, he went from a feeling that it would be impossible for him to force a conversation at one of these events to something very different. He felt more confident that he could be more natural and real as he approached people without being intrusive. He was astounded how easy it was. This isn’t about forcing yourself to do anything that feels inauthentic. Rather, these steps allow you to stand in a very authentic place and take tiny steps. You don’t have to carry a conversation all alone. All you have to do is take a few seconds to spark one. Some will ignite. Others may not. It’s okay. One conversation at a time and you’ll find yourself more confident and purposeful in all your interactions. These ideas are aligned with the wisdom that comes from “Conversational Intelligence”. Learning to connect authentically; to listen; to build relationships even in the moment; and to have productive, healthier conversations is what Conversational Intelligence is all about. We all have the innate ability to foster these skills and take our conversations to a higher level. Want to learn more about Conversational Intelligence? Stay in touch and sign up for my newsletter. I’ll be offering more content and courses and you’ll want to be the first in the know. Eileen Chadnick (@Chadnick) is a certified coach specializing in career, executive and leadership development — and a communications pro (20+ years of experience). Principal of Big Cheese Coaching and Chadnick Communications in Toronto, Eileen draws from the disciplines of positivity, neuroscience, emotional intelligence – and Conversational Intelligence®(C‐IQ®) in her work as a coach, consultant, trusted advisor, and facilitator. 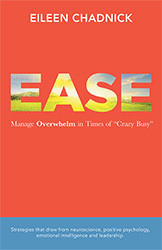 In addition to authoring the book, Ease: Manage Overwhelm in Times of Crazy Busy, Eileen is also a contributing leadership and careers columnist With the Globe and Mail.